" Few hotels and fewer private rooms have Web sites, though those intent on booking online will have some luck on www.albania-hotel.com"
Just past the tiny village of Ilias, on the two-lane highway that weaves through the Ceraunian Mountains, a sign pointing down a narrow road indicated a monastery about two kilometers on. Follow me on Facebook or on Twitter. “Why not?” I thought, putting on the turn signal of my rental car. I had no agenda other than to seek out adventure along the very affordable 80-mile stretch of beaches and villages between the cities of Vlore and Sarande, an area known as the Albanian Riviera. But the road ended at a hilltop house where an old woman dressed in black stared at me quizzically. “Monastiri?” I said in a hapless attempt at an Albanian accent in what I later discovered was a largely Greek-speaking region. She pointed in the direction of the way I had come and seemed to signal that I had missed a turn. Back toward the main road, I found a severely rutted turnoff, grabbed a camera and sunglasses from the car, and started hiking. Travel fantasy mode kicked in. Would the monks invite me to dinner? Let me stay on a cot for the next few days if I did chores? Ask my opinion about their latest batch of ale? They would not, because there was no monastery at the end of that road either. 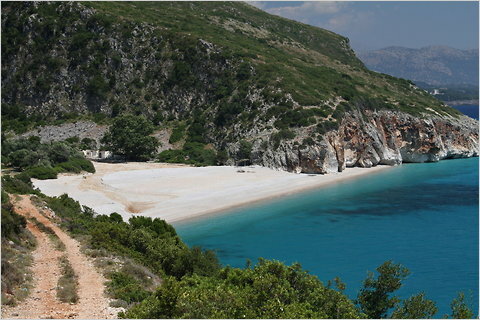 Instead, there was an idyllic pebbly beach where an otherwise inaccessible canyon opened up to the deep blue Ionian sea. There was not a soul in sight. Seth Kugel for The New York Times-Bunkers along the coast put in place by Enver Hoxha, the isolationist leader of cold-war-era Albania. Near the beach were a number of mushroom-shaped bunkers that the isolationist dictator Enver Hoxha, who died in 1985, installed across the country to defend it against a foreign attack that never came. There were more recent artifacts too: a newspaper horoscope page dated a few days earlier and plenty of soda and beer bottles that indicated the beach had been used much more recently for purposes other than defense. Seth Kugel for The New York Times--Gjipe Beach. For most travelers the starting point of the Albanian Riviera is Vlore, a somewhat tacky city with lots of outdoor cafes that have fancy cushions but too much mindless club music; the cluttered, unattractive coastline has mediocre if bustling hard-sand beaches. There’s a certain amount of chaos in Vlore – virtually no signs giving street names, nutty drivers, ugly and seemingly stalled concrete construction projects. But that’s not really surprising in a country that’s still one of the poorest in Europe and only a quarter century removed from the Communist dictatorship of Hoxha. If Albania no longer feels isolated or scary, it still seems to be finding its way. Seth Kugel for The New York TimesIn a park along the main drag of Vlore, men huddle around an intensely contested game of chess. There were two highlights in Vlore: a park along the main drag, Bulevardi Vlore-Skele, where old men smoked like chimneys around intensely contested games of chess and dominoes and warmly welcomed a visitor with a camera. I stayed in Vlore on the first and last nights of the week, but the trip’s real payoff came in the string of small towns that start once you drive up and over the perilously steep and forest-lined roads of Llogara National Park. After asking around about prices of hotels and private rooms in a few towns, I chose Himare as my base. A young man named Simos whose family runs the Internet cafe offered me a large apartment attached to his house, practically in the center of town, for 20 euros a night. (The Albanian currency is actually the lek, at 142 leke per euro or 96 per dollar, but lodging and car rental are often quoted in euros.) Himare didn’t have the best beaches, but it impressed me with cafes overlooking the water and souvlaki stands galore. And it won my heart forever when I spotted a man leading a donkey through town, trying to unload two baaing baby goats slung over its back to the highest bidder. 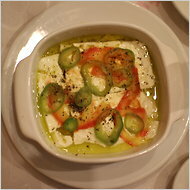 Seth Kugel for The New York TimesWarm feta with olive oil, peppers and tomatoes at Taverna Viron. Then again, she was right: pork chops with tzatziki and potatoes, shrimp saganaki (tiny shrimp in a tomato-based, feta-heavy and Tabasco-spiked sauce), and whole grilled fish were all, indeed, quite delicious. I ate alone but often chatted with interesting groups, from an Albanian-American family from Pelham Parkway in the Bronx to Amalia’s male cousins who invited me over to drink rakia, a liquor distilled from grape pomace. Though that first trip to Gjipe Beach was fun, I soon switched loyalties to Jali Beach, three miles downhill from the main highway. The beach, lined with umbrellas for rent, is very family-friendly; I’d estimate a running toddler is swept up in a grandparent’s arms approximately once a minute. And the shallow water is a shade of electric blue that designers of mint gum packaging only wish they could emulate. I was hooked on Jali not for the beach, though, but for the instant friends I made at Taverna Peshkatari, one of several informal beachside restaurants specializing in seafood. (Peshkatari means fisherman in Albanian.) I usually ask for the menu before sitting down, to scout out prices and size up the friendliness of the staff. The guys at Taverna Peshkatari were friendly: they immediately brought a bucket of fish from the kitchen, noting that the owner had caught them all this morning. Jorgo Andoni mans the outboard motor on a fishing expedition. This is what we in the frugal travel business call a ka-ching moment. Free boat trip! Local friends for the making! “When I was fishing in Albania” stories for back home! The next morning I arrived at 5:55 a.m. to find that I had beat the young man, Jorgo Andoni, who turned out to be the owner of Taverna Peshkatari. But three older guys who recognized me from the day before were there drinking espresso and rakia. They invited me to join them. Hey, a 6 a.m. shot of liquor to start the day? Why not, I’m on vacation. Soon after I was out on the water with Jorgo and his two fishing assistants – Geni Pirra and Eljon Likmeter — reeling in the nets they had laid the previous afternoon just off the rocky coast and watching them untangle their catch: merluza, cuttlefish, shrimp, even a flying fish. Round about Net 4, Eljon and I abandoned work and dived into the water, swimming over to a tiny sand-lined cove carved into the rocks. I took another mental snapshot to file under Travel Memories – Best Ever. And, this time, no sunburned Austrians to ruin the moment. You can fly to Albania from many European cities, but I’d suggest combining it with a trip to Greece, Italy or another Balkan nation. From Athens, there are daily buses via Ruci Tours to Vlore or Himare (30 euros, about 11 hours) and there’s a ferry from Brindisi, Italy to Vlore (six days a week; seven days in August, 45 euros). Then there are buses from Croatia and Montenegro: it took me seven legs and just under 43 euros from Dubrovnik to Vlore. Your results may vary. In Vlore, I rented a car for 33 euros a day (price goes down with longer rentals) from Tirana Car Rental. Few hotels and fewer private rooms have Web sites, though those intent on booking online will have some luck on www.albania-hotel.com. In Himare, you can e-mail Simos at hokyspokys@hotmail.com about his family’s rooms; Amalia and her family rent nice rooms above the Greek restaurant as well; call (355-69) 221-8728 or (355-69) 425-5755. Jorgo Andoni rents rooms; try him at Taverna Peskatari, (355-68) 200-0343. But unless you’re going in August, it’s probably best just to show up.